October is the 11th annual National Fair Trade Month. Fair trade products are "food or crafts that are produced under standards designed to end and prevent the poverty, sweatshop labor conditions, environmental degradation, etc. that are endemic to the free trade 'race to the bottom' that puts profits above people and the planet," according to the Global Exchange human rights organization. Fair trade products can be found throughout Cleveland Heights, in grocery stores, local boutiques and major chains. As the holiday shopping season begins, this month's special designation offers a chance to reflect a little bit more on purchases. Last April, three older white women here in the Heights sent out a letter to friends and sympathetic acquaintances calling on them to take up the call of author Michelle Alexander, to help build a social movement against the new Jim Crow. We read Alexander’s book, The New Jim Crow, and were horrified [to learn] that the war on drugs has caused an astounding rise in the incarceration of people of color for minor drug offenses over the last 40 years. Alexander’s exposure of the blatant injustice at every level of the criminal “justice” system had a profound effect on us. We felt compelled to do something. We were also deeply troubled by the acquittal of George Zimmerman, and inspired by the “Stop Stop and Frisk” movement in NYC. Our movement, Puncture the Silence-Stop Mass Incarceration, was formed in a living room in Cleveland Heights, where eight older women unanimously endorsed the Stop Mass Incarceration Network’s (SMIN) call for an October “Month of Resistance to Mass Incarceration, Police Terror and the Criminalization of Generations,” initiated by Carl Dix and Cornel West. Since its inception, FutureHeights has provided tools for citizens to become more engaged in their community, bring innovative ideas forward to confront our challenges and have a greater voice in civic life. Cleveland Heights is a city of neighborhoods, and it is only with strong, vibrant neighborhoods that our city will be able to sustain itself and remain a desirable place to live and work. This year, FutureHeights has applied for Community Development Block Grant (CDBG) funding through the City of Cleveland Heights to help support the addition of a staff member who can oversee a community-building program. Through this program, FutureHeights would support existing neighborhood groups and assist new ones in forming. We would train neighborhood residents in neighborhood asset mapping, data analysis and resident engagement, to enable them to create priorities for their own neighborhoods. Did you know that there two election days this fall? First, on Thursday, Sept. 18, our Heights Libraries will hold a Sesame Street Block party at the Lee Road Library. At the block party, a close election between Cookie Monster and Oscar the Grouch will be decided by your votes. It will be a great time for kids and families, and we expect some of our local elected leaders to join us and help count the votes! I would like to see how Cleveland Heights looks when 4,500 people are riding bikes. We will certainly be healthier, wealthier and maybe happier than being stuck in traffic. Does this express the sentiments of the 1 percent? In Cleveland Heights, the 1 percent are those the 2010 census counted as bike commuters—that’s 450 people. It doesn’t count kids who bike to school or spandex-clad weekend warriors—just the adult weekday bike commuters. Cycling experts estimated that 60 percent of adults identity themselves as interested in the idea of bike commuting, but are concerned about riding close to cars. So, how do we get that 60 percent to consider riding a bike for transportation—especially to commute? One Friday my neighbor called to ask if I’d put out a chipmunk trap. No, although chipmunks are all over the place. We once had a cat named Frizzy that left dead chipmunks around. I would put them in an old cat-food bag and stick them in the freezer until trash day. No point in leaving them around to smell. Well, said my neighbor, there’s a skunk caught in a trap near my fence. She had called the city to no avail. Since her husband and grown son were dealing with it, I put it out of my mind until I went to bed that night. My bedroom smelled as though a skunk was under the bed. I would check the foundation Saturday morning. How do you “feel” the community of Cleveland Heights? How about through music, laughter and delicious food, as residents found June 11 at Taste of The Heights. Here, the whole Cleveland Heights gamut joined the staff and board and kids of the Heights Youth Club (HYC) at a festival of fun that benefitted its youth. Taste of the Heights, HYC’s annual fundraiser, was a brilliant success for all involved. Twenty Cleveland Heights restaurants were the key to its success as each donated the best of their menus to produce a generous smorgasbord of selections for guests. This at a time when the local restaurants of our community were voted the third best in the whole state! Dorothy King, new HYC board member, was inspired seeing the result of the staff and board’s hard work to make this worthwhile event happen, and to see Heights residents support it so wholeheartedly. 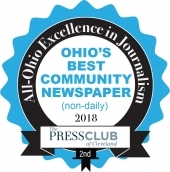 The Heights Observer is a nonprofit community publication written by community members, and focused on the cities of Cleveland Heights and University Heights. The Observer has no writing staff. The articles the Observer publishes are written by volunteer writers who submit stories about the Heights news, personalities, events and issues that interest them. 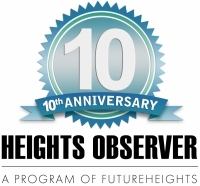 The Observer’s only reporters are those in the Heights community who take the time to write about some aspect of the Heights, and share it with others via the Heights Observer. Some Observer writers are regular contributors; others may submit an article once a year, or just once. Visit Lake Erie Ink’s website right now, and you’ll find a simple mission statement: Lake Erie Ink (LEI) provides creative expression opportunities and academic support to youth in the Greater Cleveland community. And insofar as the Coventry-based nonprofit has served more than 2,200 youths in its on- and off-site programs this past year, that’s true. Essential to what LEI does, but that is absent from its mission statement, is the an inevitable byproduct of what happens when youth feel supported and heard—Lake Erie Ink connects people. When I came to Northeast Ohio to attend college, I was little more than a tourist here. While I had a sense that I wanted to know both Cleveland Heights and Greater Cleveland better, my understanding was peripheral. Outside the bounds of campus, I had no community. When I graduated in 2012 and was hired as an AmeriCorps member at LEI, I got my first glimpse at the kind of community LEI offered—one facilitated by the conviction that young people not only have something to say, but also want to hear others as much as they want to be heard. More than 150 people attended a meeting on April 29 regarding problems in the neighborhoods of Cleveland Heights’s north side. The meeting took place at the Martin G. Lentz Police Academy on Noble Road. Mayor Dennis Wilcox opened the meeting by expressing the city’s sincere desire to hear from neighborhood residents. Five of his six city council colleagues also attended, as did several city officials. Tanisha Briley, city manager, took comments from the audience and ran the meeting. As a neighborhood homeowner since 1999, and someone who has witnessed with alarm what seems to be the north side’s accelerating decline in recent years, I found myself agreeing with most—not all—of the commentary. The topics of my neighbors’ complaints—crime, vacant homes, a perceived lack of interest on the part of city government, empty storefronts, problems with certain businesses, greatly diminished property values, misbehaving youths, and on and on—are all concerns I have lost sleep over. Earlier this year, The City of Cleveland Heights was charged with trying to conceal or withhold from reporters incident reports of violent crimes. The reports were eventually made public, but only after a lawyer was hired to force the city to comply with the Public Records Act. Average citizens, not just reporters, are entitled to request public records. A citizens’ lawsuit was filed against the City of Cleveland Heights about the failure to conduct a public hearing on the controversial Taylor Road rehabilitation project. The outcome of the case was that the city paid thousands of dollars to settle the public records claims—including a request for reimbursement of attorney fees that were incurred. As a Cleveland Heights City Councilperson and attorney, I believe in the Legal Aid Society’s mission to secure justice for our community’s low-income residents by providing free and high-quality legal services. If you have a noncriminal legal problem, but don’t think you can afford an attorney, the Legal Aid Society of Cleveland can help. This spring, the Legal Aid Society of Cleveland will host two free legal advice clinics near Cleveland Heights and University Heights: on Saturday, May 10 at the Woodland Branch of the Cleveland Public Library, and on Saturday, June 7 at the Stephanie Tubbs Jones Health Center in East Cleveland. This winter has tested the mettle of even the most winter-immune Northeast Ohioans. The frigid temperatures and frequent snow storms meant that CH-UH City School District administrators were faced even more often with that thorny decision: how bad must the weather be before school is called off? As much as parents and administrators would prefer hard-and-fast rules about when school closes due to weather conditions, such a rigid system isn’t being, and can’t really be, used. Every situation is different and has to be judged independently. Closing school is never an easy decision because every minute of instruction time counts. Mosdos has been negotiating with you privately to buy the old Millikin School property. Recent public comments made by your board president have been one-sided. They inferred that Mosdos had been nonresponsive and uncommunicative in negotiations, without mentioning that most delays were due to religious holidays that forbid the conduct of any business whatsoever by members of the Orthodox Jewish community. The 2013 election was unusually important for both the City of Cleveland Heights and the Cleveland Heights-University Heights City School District. Six of the seven council members who had been serving Cleveland Heights in 2009 retired after long and distinguished service: Mayor Kelly, Nancy Dietrich, Bonnie Caplan, Mark Tumeo, Ken Montlack and the late Phyllis Evans. All did great things for the city. The passage of the increase in school millage will improve the educational experience offered in the CH-UH school district. The juxtaposition of a new council and new hope for the schools presents great opportunities for Cleveland Heights. Cleveland Heights is projected to end 2013 with under 300 foreclosure filings this year, which is a substantial reduction from the past six year average of almost 500 per year, according to a recent report by the Thriving Communities Institute. That is the good news. The not-so-good news is that 300 foreclosures this year is still twice what our community averaged in 1995. Foreclosure usually leads to vacancy, and far too often, vacancy leads to blight, which devalues our homes and threatens the safety and stability of our neighborhoods. A group of concerned residents from Grant Deming’s Forest Hill neighborhood, along with supporters from nearby neighborhoods, have stepped forward and embraced a strategy being used in other communities battling this problem, called a foreclosure bond. In the discussion about Issue 81, the CH-UH City School District's capital project, the debate can be broken down to three components: The Need, The Plan and The Cost. The first leg is the need. Between the state's report on our facilities, the IKG report, Regency's work, the Lay Facilities Committee's work, and staff opinions, anyone who denies the need would deny gravity, that the world is round and Barack Obama is an American citizen. I have toured every building, read every report and reviewed hundreds of photos taken by the Ohio School's Facilities Commission. The need is real. There have been several letters and opinion pieces in the Heights Observer recently that press the issue of what the $134.8 million facilities bond issue [would] do for education in the CH-UH District. [http://www.heightsobserver.org/read/2013/09/16/public-education-matters, http://www.heightsobserver.org/read/2013/09/24/how-to-pass-the-chuh-facilities-bond-issue, http://www.heightsobserver.org/read/2013/08/23/sustainable-buildings-will-help-teach-our-students] This is a central question for school leaders. We hope they can offer some significant information before the Nov. 5 vote. School bond issue: Are you for or against? For the past several weeks, the Heights Observer has asked CH-UH residents to weigh in on the school bond issue by participating in the Observer’s online “Daily Question.” It asks residents how they would vote if the election were held today. Of the approximately 60 responses received to date, Heights Observer editors selected 10 “no” and 10 “yes” vote comments that represent the most common reasons people gave for their votes. Some responses are too long to reprint here in their entirety. We have, therefore, taken some out of context, but believe we have distilled the main point of the responder. To participate by adding your opinion to the conversation, and to read all the comments in their entirety, go to www.heightsobserver.org/daily-question. As parents, we each have our own reasons for choosing a school. Some of these reasons are rooted in family tradition, a desire for a religious education, or access to specialized programming. Others, however, are rooted in misconceptions. I am writing to members of our community who tell families with young children to avoid the CH-UH schools, to those who suggest we shouldn't support our schools until "they do their job," and to those who imply that enrolling a child in our public system is a mistake. Over the last three years, working on the District Facilities Project, I have spent a considerable amount of time on this subject. Not only have I read all of the pertinent reports, I have toured all of our buildings, frequently starting in the boiler room and working [my] way up to the roofs, including the clock tower at Heights High. As such, with all of discussion and debate over the District’s Bond Issue, the following are items to take into consideration. It has been 40 years since our last renovation program. If we move past the poor architectural designs, dated colors and poor placement of additions, and look at what was done in the 1970s, we find much of the work was cosmetic, failing to address serious systemic issues. I remember when, because I’m not old enough yet to say, “When I was a kid . . . ,” you had to look both ways before you crossed the street. My mother made sure every time I left the house that I would remember this very important rule. Later, when I learned to drive, I was told to make sure I not only looked left and then right, but also left again, just to make sure. When I had children, I made sure to pass on this time-honored advice so that they too would be safe out there in the world. I remember that when you wanted to cross the street, you would wait at the curb or the corner and let traffic pass, and when it was clear, and only when it was clear, you would take that step off the curb and into the crosswalk; and, you always crossed at the crosswalk ‘cause that was the place to do your crossing. “It is solved by walking.” So an ancient saying tells us. We cannot solve everything by walking, but sometimes we can make progress in responding to life’s challenges by walking. This year, along with thousands of other people affected by suicide loss, I will be walking to raise funds to combat what has become a national epidemic. Cleveland's Out of the Darkness Walk takes place on Saturday, Oct. 19, at Wade Oval in University Circle. A living wage is harder and harder to come by for many young people. In personal conversations, numerous people conclude that present and future employment is most available in the technical trades and engineering. Consumers and voters need technical knowledge to make the best decisions possible in life. To give all our children hope and pride in their futures, we need to enable them with significant Career Technical Education (CTE) and Science, Technology, Engineering and Mathematics (STEM) education, along with the arts, language, social sciences and history. Hope is a key motivator for students. At present, limited CTE exists at Heights High and not at all for the lower grades. STEM is weak throughout K–12 in the district. The district is trying some things to change that, but it remains too little. Sustainable refurbished buildings provide an opportunity to create the space and infrastructure, which costs so much that it has handicapped the district from providing better CTE and STEM to-date. We can get a lot more than bricks and mortar from the bond issue being voted on this November. We can make an education leap that many voters want. The current buildings in the Cleveland Heights-University Heights City School District consume between 150–218 thousand BTUs per square foot each year. The 1970s buildings use around 150 thousand BTUs per square foot per year, while the 1950s buildings use 200 thousand-plus BTUs per square foot per year [See the report published by the Lay Facilities Committee's Sustainability Working Group (LFC/SWG), pages 17–20]. The year 1995 was memorable for the City of Cleveland Heights. A first-of-its-kind ordinance was passed, which prohibited the use of cosmetic pesticides and herbicides on public grounds, including parks, schools, libraries and day care centers. Here's the story. Cleveland Heights High School athletic teams have had great and growing success in recent years, with undefeated seasons, LEL championships, and state playoffs becoming the norm in several sports. More importantly, in a district as economically and racially diverse as ours, scholastic sports are a common denominator that brings everyone together. Heights High athletics play a critical role in our efforts to educate well-rounded students with character, and we need the right facilities to continue that education and source of community pride. That’s why the district is moving ahead with plans to secure funding for a new field, among other renovations to Hosford Field at Crawford Stadium. Cleveland Heights Move to Amend is organizing an event that will ramp up the group’s petition drive to put a citizens’ initiative on the Cleveland Heights ballot in November. The measure calls on Congress to amend the U.S. Constitution to establish that corporations are not people and money is not speech. We invite all area citizens to join us on Saturday, April 20, 1–4 p.m., at Ensemble Theatre (located at 2843 Washington Blvd.) to pick up petitions and walk lists, receive a brief tutorial on signature-gathering, and disburse across the city in pairs, going door-to-door to collect signatures of registered voters. The afternoon will conclude with refreshments, sharing experiences, and a tally of the signatures collected that day. Anyone registered to vote in Ohio may circulate a petition, so we encourage our friends from neighboring suburbs to join this entirely nonpartisan effort. Teachers on the picket line? Since March 3, the Strongsville teachers’ strike has been the subject of gossip statewide. Even the San Francisco Chronicle reported on this local story that happens to symbolize the most divisive issue facing public education today. The right of teachers to unionize affects every school district during this era of budgetary cutbacks and mass layoffs, and it is particularly important to Cleveland Heights and University Heights as the local teacher’s union prepares to negotiate a new contract this spring. It may seem doubtful in the midst of “pothole season,” but Cleveland Heights streets are improving. In 2009, the city completed repairs on just 11 of its more than 270 streets. In 2010, work was done on all or part of some 18 streets; on 31 streets in 2011; on 53 streets in 2012; with 33 more streets slated for work in 2013. By the end of 2015, the city expects to have dealt with virtually every street. Alex Mannarino, public works director, gets credit for having instituted a systematic plan for road maintenance three years ago. Street repairs are prioritized based on road evaluations, complaints received about potholes, core samples and available funds, which have remained stable at about $2 million over this time frame. Each road receives a score and is rated very good, good, fair, poor, or very poor. On Thursday, Feb. 7, University Heights (UH) resident Anita Kazarian interviewed John Novosielski, president of Local 974 of the International Association of Fire Fighters. Kazarian’s questions and Novosielski’s responses follow. Q: One hundred percent of University Heights (UH) firefighters are trained as paramedics or emergency medical services. Is this true of Shaker Heights firefighters? A: No. University Heights is 1.9 square miles and covered by two advanced life support ambulances, with everyone in the department trained to provide a high level of service. Shaker Heights is 6.3 square miles and covered by three ambulances, with only 53 percent of the department [trained] as paramedics. Currently, UH residents have a quick response time—under four minutes. Shaker’s response time is under five minutes. Most calls are heart attacks or strokes where brain damage can occur in four to six minutes. One minute can make a life or death difference. Would our community leaders and parents knowingly and willingly increase children's exposure to harmful toxins? Of course not—with the key words being "knowingly" and "willingly." We all want to do well by our children. That is why the Cleveland Heights City Council was the first in the country to ban the use of pesticides on public property, school grounds and playing fields. The wisdom of that measure is supported by health experts, who suggest limiting one’s exposure to pesticides and other toxins. Two years ago, artificial turf was laid down on Denison Field. Research on such fields has resulted in warnings and recommendations from public health and pediatric environmental health experts. There are concerns that the many toxic chemicals used in artificial turf's crumb rubber infill may make their way into children's bodies, the surrounding environment, soil and groundwater. Cleveland Heights citizens are joining others across the country in a non-partisan attempt to overturn the controversial 2010 Supreme Court decision, Citizens United v. Federal Elections Commission. Equating money with speech, the judicial majority ruled that limits on corporate and union campaign contributions were a denial of First Amendment rights, opening the floodgates regarding election spending. Move To Amend (MTA) is a national movement seeking to challenge and abolish corporate constitutional rights and regulate political contributions and influence from corporations and wealthy individuals in elections and government. Both Cleveland Heights and University Heights have ordinances that require property owners to keep the sidewalks clear, yet they are often not enforced. We take pride in our walkable communities, but are they so walkable when it snows? Many sidewalks remain covered in snow and ice, and pedestrians, including children on their way to school, resort to walking in the street. Cleveland Heights has hired a consulting group to conduct the search for a new city manager; Ed Kelley has been quoted as saying that search could cost between $60,000-$125,000. I hope everyone who is interested in this expensive process and important decision will go online and read the job description being used to guide the search. It is available at the Novak Consulting Group website. The firm is located in Cincinnati. Three things stand out: a bachelor’s degree is a required qualification; the hiring range is $130,000–$150,000; and the person must live in Cleveland Heights. Education in the age of the iPad: How can we adapt? Heights residents agree that the thefts that forced the district to overhaul its digital technology policy were contemptible, and represent a moral failure on the part of those who allegedly robbed middle schoolers of the iPads they were given to improve their computer proficiency. Our community will not tolerate wrongdoing, and in many respects it has been cheering to see how quickly local government, law enforcement and citizens have reacted to protect schoolchildren and ensure no more thefts take place. However, it has become clear that—given the cost of the devices, and the high value many place on access to the kind of technology used by Heights students—the conditions that led to the thefts are not likely to change in the near future. For years, I had wanted to volunteer. For both myself and for those around me, I wanted to do something meaningful, and have a positive effect on the community. But each and every time I called an organization to see if I could help, I was told the same thing. “You can’t volunteer, you’re under 18. Unless you have adult supervision, you’re too young.” I got frustrated and discouraged, feeling that I was too young to make a difference. Years passed. Finally, as a high school senior one year ago, I came up with a simple but powerful idea: recruit a few teachers to act as adult supervisors and create a youth volunteer group. I got some of my friends excited, enlisted the help of Cleveland Heights High School teacher Chris Sutton, and went to work. Project Build was born. Will a new city hall parking lot help our city? Will greening City Hall’s parking lot attract new residents or help our businesses? I've never participated in team sports, but am thrilled to have joined Tiger Nation, the team of students and families who comprise the Cleveland Heights-University Heights public schools. I'd like to extend a warm welcome to new families joining us on what I hope will prove a satisfying journey in the CH-UH school district. My son is a second grader at Fairfax Elementary School. Though my family is just three years into our journey, we have already benefited from our educational and social experiences. We've also happily shared our own modest resources to support and enrich the educational experience of the students. On this journey, you, like us, will have the opportunity to make great friends and support the success of not only your own child, but other children and, thereby, the broader community. I just checked weather.com and the official temperature is 96 degrees. A few days ago, 2012 was declared the warmest year on record for Ohio. In a time when many other communities are building new pools, Cleveland Heights destroyed one of its two public pools. Denison Pool was demolished a few weeks ago. Denison Pool was destroyed and a new soccer field was built—not over the pool—but next to where the pool used to be. The new soccer field could have been built elsewhere in our town. It could have been built at Denison without destroying the pool. After the 2010 Citizens United case wherein the U.S. Supreme Court decided that corporations could spend unlimited amounts of money on political advertising, people across the country decided that enough was enough. Just two short years before, the big banks had pulled the country, and the rest of the world, into a mire of recession resulting from their bad judgment and greed. Years before that, important banking oversight regulations had been demolished at the behest of big banks and their lobbyists. As the argument went, business knows best how to run itself and must be freed from the shackles of government. Could “Coventry Cash” revive Coventry Street Fair? Organizers of the Coventry Street Arts Fair should consider an idea that could help any future fairs be both safe for individuals and successful for local businesses. 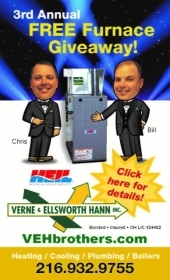 What about a "federal-cash-for-Coventry-Cash" entry fee exchange? Charge $5 to enter the fair. In exchange, each entrant would receive $5 worth of Coventry Cash—coupons redeemable for food or merchandise that day at any participating business or vendor. Five minutes. That was the amount of time members of the Cleveland Heights-University Heights Board of Education were willing to allow for public comment before they make a decision on a $200 million capital project that will be the single largest civic project in our community’s history. At the June 5 board meeting, I asked if they would entertain public comment at their work session on June 19, or schedule another community meeting on the final plan. The reply was “No.” June 5 was the last opportunity for public comment, except for July 3, the night board members will cast their votes. I’ve waited more than 20 years for the community to give our children the buildings they deserve. However, I feel that I have no other choice: I cannot support the current facilities plan. If it is on the ballot this November, I will, for the first time in 27 years, vote “no” on a schools’ issue. “I don’t get a second chance to do this,” said Kal Zucker, CH-UH school board member, at the April 23 work session, where master facilities Plan C was presented to the board of education (BOE). The BOE acknowledged that residents are voicing opinions on what they are willing to support. I believe the BOE grasps the gravity of the situation and understands the need for broad-based community support before a final plan is placed on the ballot. I commend the BOE for questioning the position that only two options exist: Do nothing and continue to let the district bleed; or implement Plan C, a bold, large-scale plan that many in the community perceive as divisive and expensive. Being a kid in today's society makes my own childhood look primitive. Grade school children can be seen bandying about cell phones before and after school. Video games and video game systems were once the status symbol of a family that was well off. Instead of the world being right outside your door, it's now available in any part of your house as long as the Wi-Fi signal is strong enough. If there is one constant that hasn't changed from my childhood to that of my children, it's bullying. This past January, following Edward Kelley’s reappointment as mayor of Cleveland Heights, he made the statement that the city will “take back the streets.” On Monday, March 21, at the FutureHeights annual meeting, he reiterated that statement when presenting a council proclamation to Deanna Bremer Fisher, executive director of FutureHeights, in recognition of the 10th anniversary of the organization. Given that Cleveland Heights is a built-out suburb with few opportunities for cutting-edge planned developments, I question the relative emphasis given to such developments in the proposed changes to the city's zoning codes. While doing something sustainable with the Oakwood property makes sense, and while one day turning Severance into another Crocker Park could too, the changes ignore the fact that the city comprises mostly older homes that could be made markedly more sustainable with the right investments. What does it mean to build community? How can one participate in developing a close-knit community and neighborhood? If you’re reading the Heights Observer, you have taken the first critical step of becoming informed about local goings-on. Now, where do you go from here? I saw in the last issue that the re-elected Mayor Kelley is encouraging the community to "take back the streets." Sadly, there are several hours during the day when my friends and I are prohibited from being on the streets near my house, so I don't know how I can help. I'm an honors student, have never been in trouble at school or with the police, and dedicate hours of my time entertaining the community in the Heights High Marching Band and Symphonic Winds. There are a few thousand middle and high school students in our community who are similarly good citizens, but are being punished for the actions of a few dozen. I don't want mobs, fights, or melees any more than the adults of the community, but I think there are much more proactive ways to prevent them. But we're kids, and you're adults, and it is easier to just push us around. Whatever happened to respecting your elders? Since I have had kids of my own, I have concluded that if a kid is stupid enough to pick a fight with an adult, then that level of stupidity is going to haunt him for the rest of his life. One day I took two of my kids, Finn and Colette, to a popular playground close to our home. Colette was pulled in our wagon while Finn walked with me. As usual, I parked the wagon at the willow tree on top of the hill. A half-hour later, Finn was playing at the top of a big hill with a group of new friends, while I pushed Colette on the swing at the bottom. Mid push, I noticed two boys shooting down one of the smaller hills in a wagon. Thorough and proper planning for school facilities is critical for the success of all school districts—no matter how large or small. It matters not whether major construction is in the works or if the district is managing enrollment declines. This is a process through which all districts must eventually go. When school districts properly plan for their facilities, they have schools that are better suited to serve the community. Additional public use is facilitated and the district creates a higher value for public spending–something that is currently needed across district and state borders. The Cleveland Heights University Heights Board of Education has begun planning the next 50 years of school and administrative buildings programs. It is anticipated that a number of existing buildings will be closed, renovated, rebuilt, or replaced at a cost likely to run into several tens of millions of dollars. The process has already begun, and is gaining momentum. I worry lest "sustainability" become just a fashionable buzzword to which everyone pays lip service, but for which no one person is actually responsible or accountable. While sustainability has been identified as a key concern, no one individual has been given responsibility as a director of sustainability. As I recently drove down Warrensville Center Road, I saw dozens of felled trees. Since it now seems inevitable that the Oakwood development will go forward, I have a few requests for Mr. Schneider that I think would minimize the negative impact of the loss of green space. First, please preserve some real, usable green space for the community (in contrast to Legacy Village). It's come to this. Finally. I'm begging. I'm begging for a pro bono lawyer, or for someone(s) with deep pockets. Because. I. Don't. Want. To. Lose. We can't lose. It's way too important. Unless we get it reversed in a court, the ill-advised and unconstitutional rezoning of the Oakwood golf course in South Euclid will, too late, be recognized as the turning point upon which the Near East Side Suburbs (NESS) began their rapid decent. “Unconstitutional? What the heck is he talking about?” you may well ask. RALPH SOLONITZ (artist/writer) was born in 1947 in Munich, Germany, the son of Holocaust survivors. He began doodling very early on . . . first in German and a few years later in English. His father gave him motivational advice . . . "stop your doodling, you are vasting time and vill amount to nutting." Fast forward 55 years, thousands of dollars in therapy and he still can't stop doodling. Bravo to a new bike lane! Bravo to a safer North Park Boulevard! Bravo to one lane of traffic? Yes, I think it's grand that North Park Boulevard is now officially one lane of traffic. I think it was a wise choice and one that should be applauded. Instead of an autobahn speedway we now have a normal road. I am a dog owner and we love the Doan Creek park area that runs all along North Park and up through the Heights. Each and every day I walk the Doan Creek Park and I see runners, hikers, cyclists on their way to work, and other dog walkers. I see these improvements as helping to protect each and every one of us and even the people driving cars as well.